Do you love talking a lot like forever? And then at some point you noticed your CHUMS would just turn their faces away from you, or made a gesture saying “Go fry an egg and stop bothering me!” Well, you can put the blame on bad breathes or medically known as HALITOSIS. 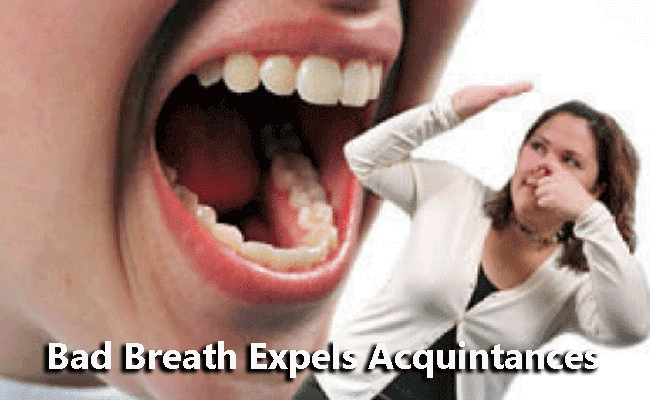 Bad breath is characterized by noticeably awful odor of the mouth which is a result oflousy dental habits or may be a sign of other serious health problems.You can have it once in a while but if it prolongs, it may signal a chronic condition like liver failure. Have you eaten pungent foods like garlic and onions? Or have you been with an associate who just love eating those? You are hopping mad to get rid of that situation. It takes a lot of courage to go head to head with him and tell he has that nasty smell in his mouth. It is just so impossible to tell them the truth without hurting them first. They may not want to tell you or you don’t want to hear it either. So here’s how to discover it. SELF TESTING. Lick the dorsal area of your hands. Allow to dry for few seconds then smell it. If you find it offensive then that’s it! Or you can try the SPOON METHOD. Grab a spoon, turn upside down, scrape the back of your tongue and sniff it. Just peanut and no sweat! If still in doubt, ask second opinion. If you tested positive, then spend no time wondering what to do. Brush it right away. Dental flossing and mouth rinsing using mouth wash can provide relief. If it still persists, be prepared to see your trusted dental hygienist. Then off you go, you can talk until you are blue in the face!